In this post we will be looking at www.3ders.org, an excellent source of information not only for beginners into the 3D printing topic but also for those who already have some experience. In particular, we will analyze their printer comparison (here: http://www.3ders.org/pricecompare/3dprinters/), whose latest version is as good as of 4th of this month of October. The first thing that one looks at in these lists are, naturally, prices. But we could also sort the list by any other column in order to get some interesting conclusions. Regarding the prices, it is possible to see how they range between the few hundreds to the several thousands of dollars. The next question that arises then, is: how is it possible such a huge variation? What makes one printer worth more than another? This is what we will try to figure out in this post. If we go sorting by each one of them (default is price) there are very interesting conclusions we might get to. To begin with, the Fused Filament Fabrication (FFF) technology, an open-source version of the Fused Deposition Modelling (owned by Stratasys), is just the cheapest up to the 60th place. This indicates that as of today, the technology of plastic extruders is, in general, not only more popular but also more affordable. Also, they are the most abundant. As FFF, FDM and SDM (Stick Deposition Modelling) are all of this type, we can count up to 102 entries referring to those printers in which a nozzle gets heated and deposits molten material where desired. On the other hand, the printable size (build envelope in the jargon) seems to be a decisive factor in the price. It really looks like in printers, size matters. The graphs below show more or less this relationship between price and the given size of the printers. 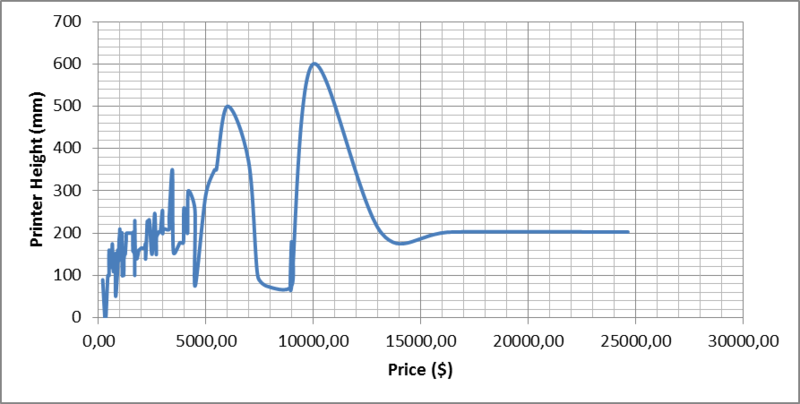 The first graph is for the height and the other gives the price as a function of the area. The first hundred entries are contained between the $200 and the $4000. Although showing some deviation, the average price grows almost linearly both with the area as well as with the printable height. As the build envelope is mostly defined by the actual robot, we can conclude that much of the actual price is originated in the mechanical part. However, despite most of the printers define their price according to their size, still the most expensive ones refuse to fit in this criterion. What might be, then that makes some models so expensive? Sorting the entries by positioning precision doesn’t seem to give an answer, as there is no data available for the SolidScape 3Z studio. So, a check to the type of technology tells us that it is proprietary (i.e. royalties are being paid), and after some research we find out that its main asset is its precision and, more importantly, its target market: jewelry. In conclusion, proprietary printers are more expensive for no apparent reason, other than subjective value added. 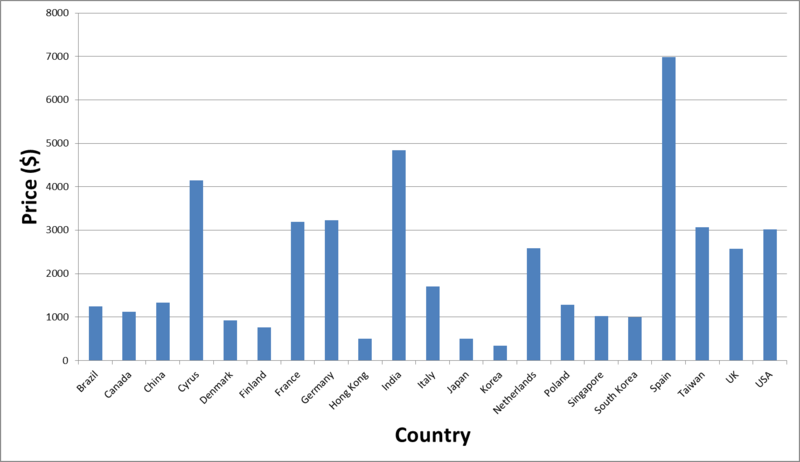 And lastly, as a mere curiosity, we are showing the graph below where the country of origin is compared against the price, showing that the most expensive products happen to come from Spain, whereas Koreans make the cheapest printers. 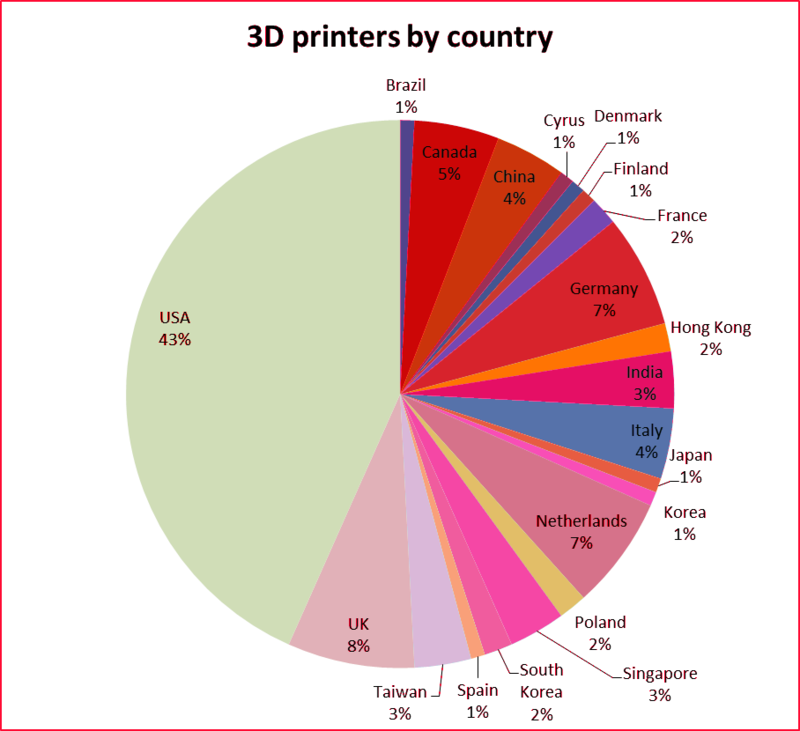 Also, the main producer (by far) of printers is the USA.